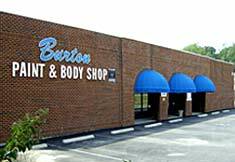 Burton Paint & Body Shop is family owned and operated and has been providing excellent customer service and superior workmanship for over 25 years. We pride ourselves on maintaining the highest levels of product and service and offer our customers a 100% satisfaction guarantee. With our on-site specialty collision center, "Burton Paint & Body Large Truck Shop", we are able to complete not only repairs to automobiles, but also Class A & C Motorhomes, Limos, Campers, Box Trucks, Semis, Trailers, and fiberglass vehicles. Located in Hanover County, we are convenient to the Glen Allen, Richmond area and The Town of Ashland. We have 6 comitted customer service specialists to continually assist our valued customers. Our I-CAR Gold certified technicians always strive for timely, quality workmanship on every vehicle we repair.